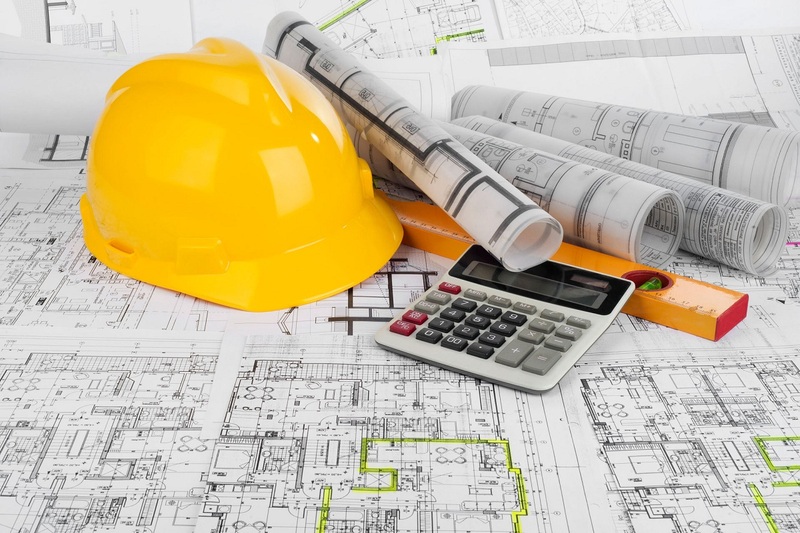 Here We learn to choose piles for private construction and deal with their key features. Wooden piles are great for private construction. They are cheaper than metal and reinforced concrete, and with a small load, they cope as well. Today, wooden piles are used in the construction of cottages, temporary structures, and small bridges. The raw material for production is wood of larch, cedar, oak, pine or fir. Use a healthy straight-barreled winter forest. Piles can be whole and spontaneous. The whole has a length of 4.5-16 m, cleaved – up to 25 m. When the splice occurs, individual segments are joined end-to-end with linings. However, for private construction, the length of solid piles will be sufficient. Splicing technology is sometimes used to increase the diameter – this is a batch splice. The lower end of the wooden pile receives a sharpening, the length of which is about 1.5-2 diameters. If the dive is carried out on a hard ground with numerous obstacles, then the tip is protected by a shoe. The upper part is also protected by the headband since the pile is assembled by clogging, pressing, or by vibration. Metal piles can withstand more severe loads than wood piles, but they also cost more. On this foundation, build large brick cottages, as well as lighter frame houses, houses of timber. Metal piles are suitable for strengthening the emergency foundation, as well as when building extensions to an existing structure. These products are manufactured from seamless steel pipes, but steel piles, I-beams, and other rolling profiles may be used. The diameter ranges from 25 cm to 100 cm or more, and box-section bottoms are also available. 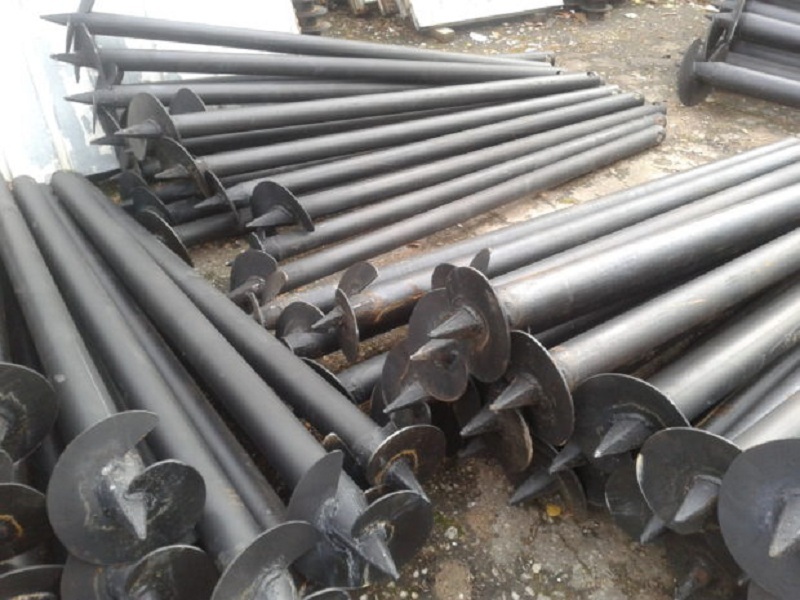 As a rule, metal piles receive a pointed tip, but it may not be. If the weight of the structure is large, then reinforce the foundation can be by filling the hollow metal piles with concrete, but in private construction, this is used extremely rarely. Separately, it is necessary to identify screw piles, they have blades at the end, due to which they have strengthened strength properties. Screw piles are immersed by screwing. With their help make a foundation for the extension, because there is no dynamic load on the ground. Often, screw piles are used to strengthen emergency foundations: they are installed along the contour of such a base and are attached to it using special brackets. Normal producers cover the product with an anti-corrosion coating, but even under it, you can consider the quality of the welded joints. Welding should be performed by a continuous seam, using wire technology. Quality of anticorrosion coating you can evaluate, trying to scratch it a little with a key or a coin: in the normal way, this will not be so easy. Screw piles can have a welded or cast tip. The cast is, of course, better, but in private construction, it will also fit a welded one – the loads are small. Reinforced concrete piles in private construction are used less often – they are designed for more serious loads and are indispensable in multi-story and industrial construction. 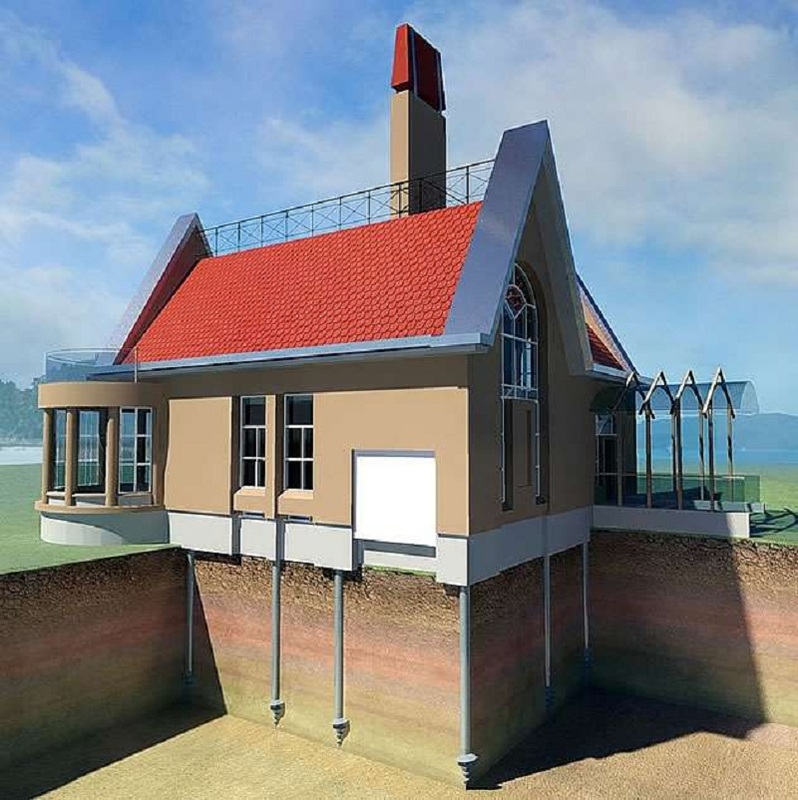 Nevertheless, on weak and mobile soils and in conditions of a sharp change in soil moisture such piles will be the best option for the private construction of cottages. 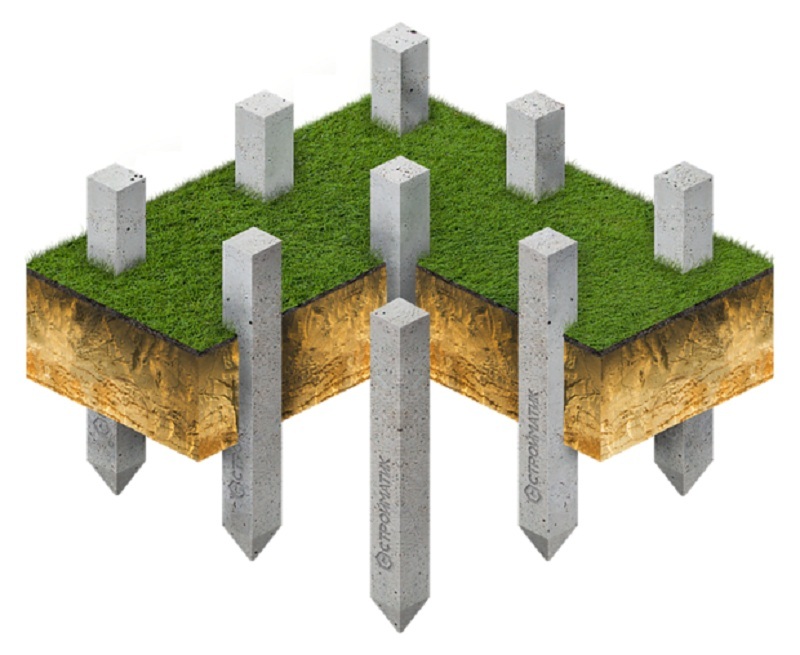 Monolithic piles have a square or rectangular cross-section, the side is from 20 to 40 cm. They receive longitudinal reinforcement of a strained or non-tensioned reinforcement, the transverse reinforcement is performed using a low-carbon wire with a section of 5 mm. Monolithic piles are also produced with a cavity inside the cylindrical shape, but the wall thickness in them should not be less than 4 mm. When immersed in the ground, the monolithic piles are protected with a steel shoe. The upper part, which takes on the impact load, is closed by the headband in the form of several grids. 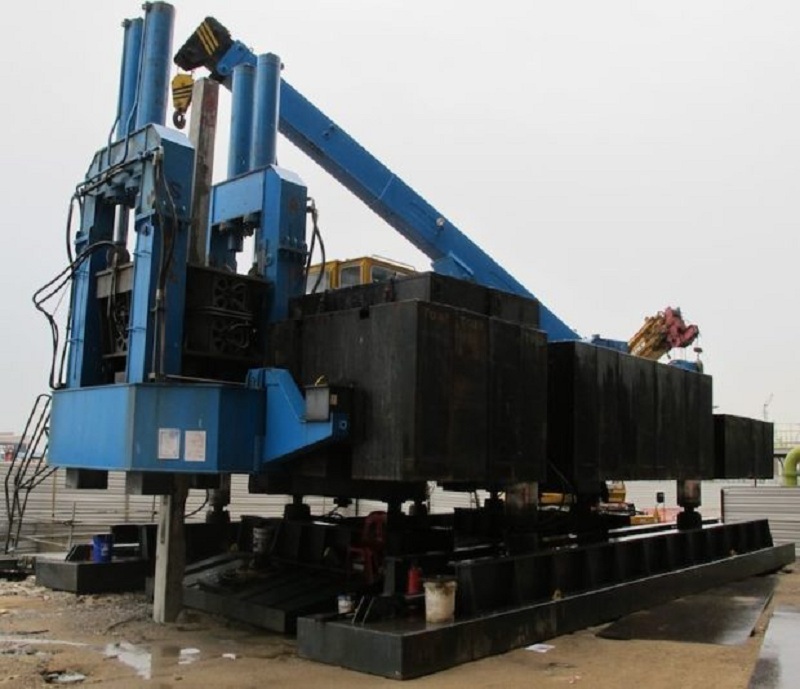 Prefabricated piles are assembled from several sections, the length can be anything. As a rule, the assembly is carried out in advance, but very long piles can be assembled at the installation site. 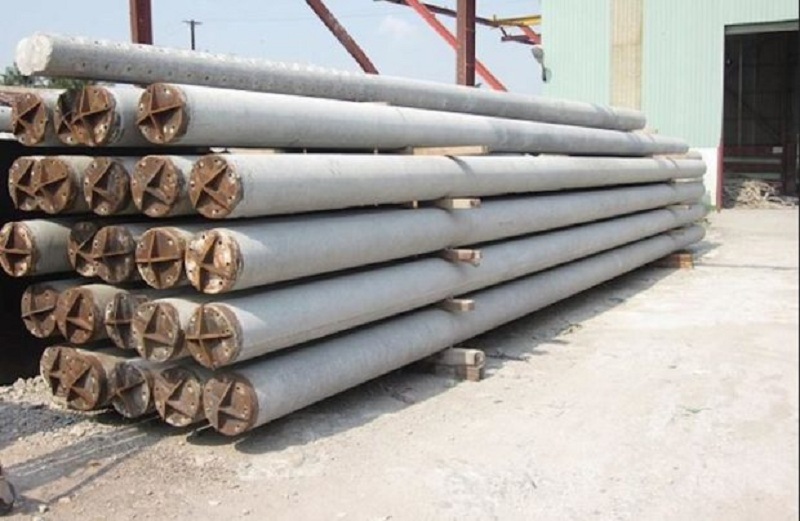 Reinforced concrete piles are mounted by a method of stuffing, which is their main disadvantage. Not only is it noisy, so even in areas with dense buildings, changes in ground masses can occur. Another disadvantage is the difficulties in terms of transportation because the iron piles are large, heavy and easily damaged. They need to be transported in horizontal rows with the same orientation of the ends. 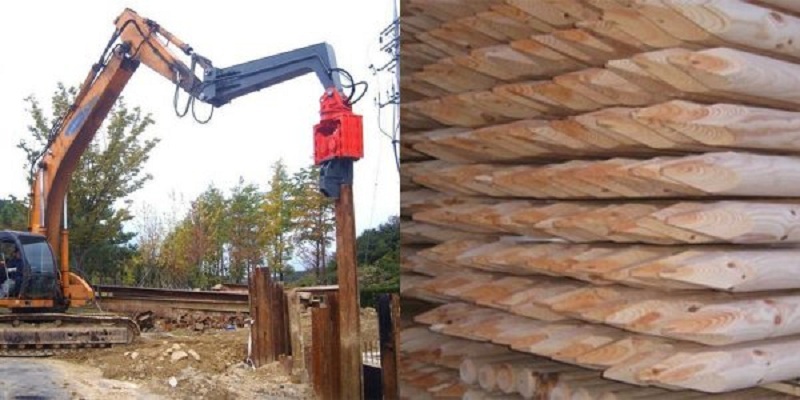 Between the rows, it is better to lay wooden liners, and the round piles are transported together with special bars, which will not allow them to roll down. 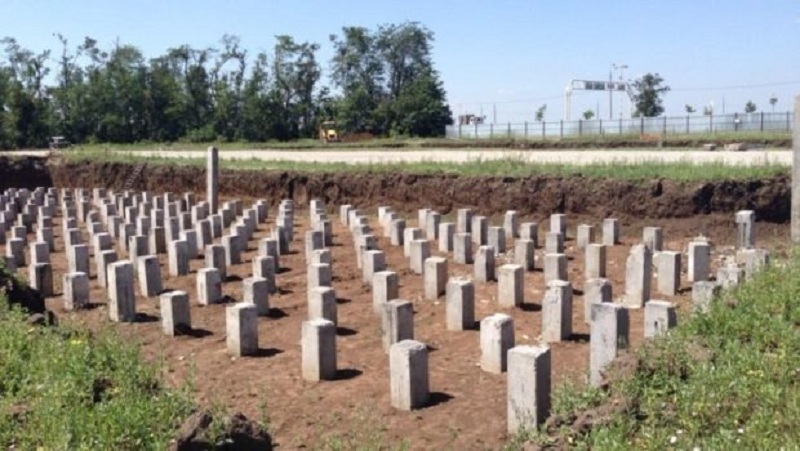 Nevertheless, the advantages of ZhB piles are many. With their help, you can create a solid and reliable foundation. Moreover, when they are clogged, the soil is compacted in the immersion area, which has a positive effect on strength. From the reinforcement and concrete also make pile piles, only they are created directly on the site of construction by pouring concrete into drilled wells. This, as a rule, reinforced concrete piles with a pointed end. 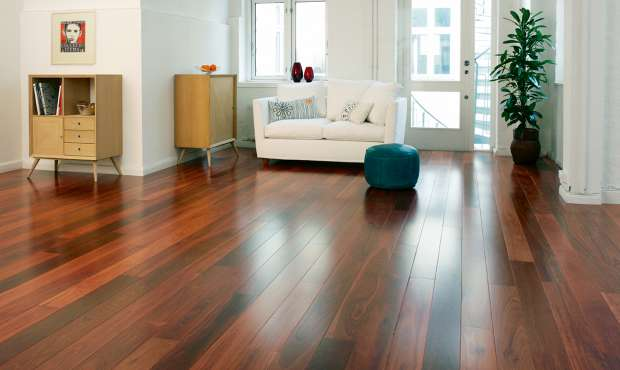 Installation takes place thanks to the use of special impact installations. Piles are protected from destructive loads thanks to the headrest. The main advantages of such piles include universality: the method can be used on any ground and in any weather. Speed and productivity are high, and the ground around the pile is slightly compacted, which increases the bearing capacity of the future foundation. Among the minuses is the inability to use near other structures, since the effects of the impact of the shock wave can be devastating. You can force the pile to dive into the ground if you apply vibration to it. Vibration is transmitted to the ground, reducing its force of friction and resistance. The soil becomes floating, and the pile sinks under the influence of its own weight. With a similar effect, the soil around the pile also compacts, so you can talk about the natural reinforcement of the foundation. This method is used when dealing with sandy and water-saturated soils. It is more difficult when working with low-level and dense soils, and for rock rocks, the vibrational method is not at all suitable. Among the advantages of vibrating piles are less noise and a relatively small cost of arrangement. Without special equipment, of course, not do, but it can be rented. 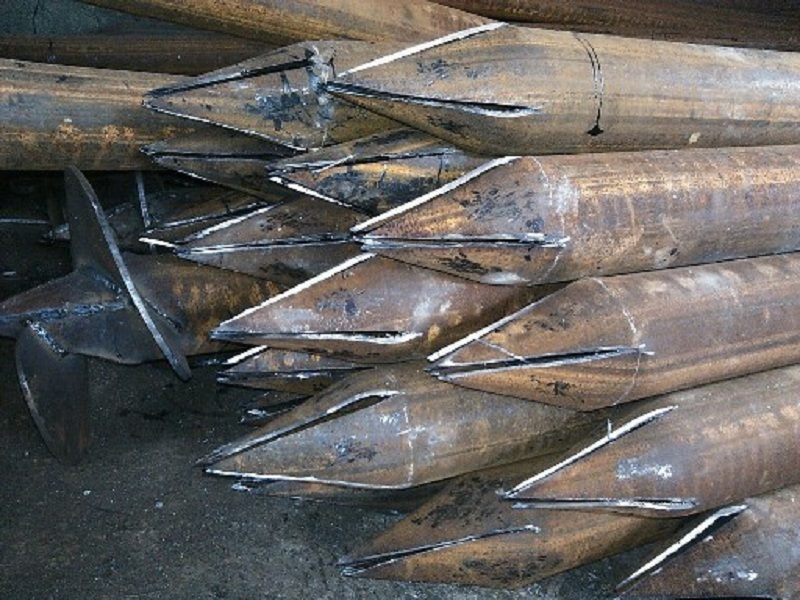 The screwing method is used for metal and reinforced concrete piles with a steel tip. Screw piles are distinguished by the presence of blades at one end, thanks to which their entry into the ground occurs. Installation can be done manually, but it is easier to use special equipment. Screw piles are used on loose and flooded soils, and also when it is necessary to equip the foundation in a zone with the dense building so that when building a house in the city it is an excellent option. In private construction, such piles are used extremely rarely. The pile is affected by a large static load, and the equipment that creates it requires a sufficient amount of free space. This method is used when working with hard and dense soils. pouring concrete. In some cases, casing pipes are then removed, but often pipes that are not dismantled are used. An advantage of the method is relative simplicity and cheapness, therefore in private construction, this method is very popular. Transportation of long piles is not necessary, but it will be necessary to prepare a great quality of concrete, and here without concrete mixer anywhere. Experts say that an unpleasant feature of this method is the inability to control the quality of piles produced. As for the restrictions, on the soils prone to swelling and horizontal movement, such a foundation cannot be used. Hanging piles. Transfer the load to the soil through the force of friction against the side walls of the soil. Such piles are installed in places with a high level of groundwater. hollow square and round piles. Metal piles, as well as some reinforced concrete piles, are produced like this. The latter is used in the construction of low-rise buildings. The choice of the type of piles, their number and dive sites are best entrusted by a professional, as this is a very important stage. However, most do not prevent to know the basic principles of calculation. It takes place in two stages. First, you need to determine the total weight of the structure, and then calculate the load-bearing capacity of a particular pile in a particular soil. useful loads. 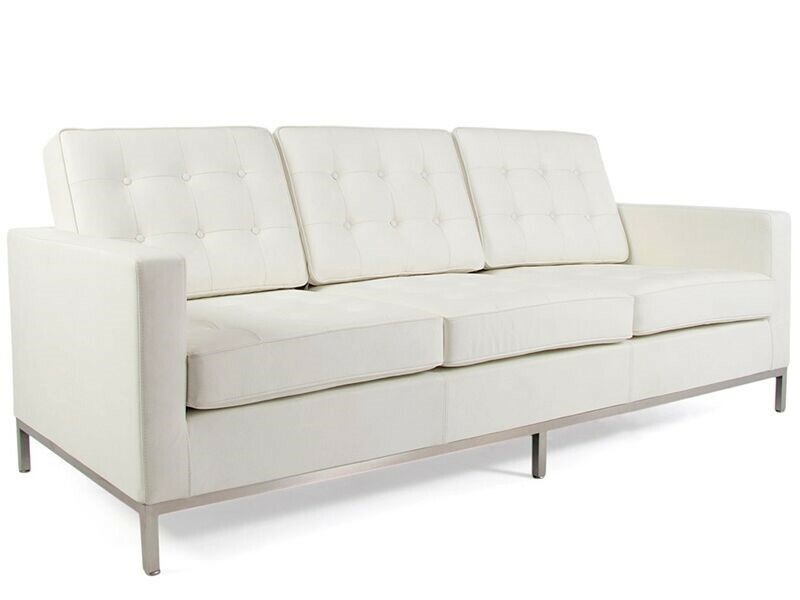 This includes the weight of the furniture to be used, and the people living. In order not to clog your head by counting the mass of all pieces of furniture, you can use an average value of 150 kg / m 2. The data obtained are summed and multiplied by a safety factor of 1.2. The bearing characteristics of the pile depending on the type of soil. Ideally, it is necessary to conduct geodetic studies to know exactly the carrying capacity of the soil, but if this is not possible, you can use the tabular data – just know the type of soil. For example, the bearing capacity of dry clay of medium density is 2.5 kg/cm 2, and of dense coarse sand – about 6 kg/cm 2. Each type of pile has its own bearing capacity. For example, we need to build a 2-story house made of a bar with dimensions of 10 * 8, we will use screw piles 89 * 300 mm. If the house is located in the central strip, then the snow load will be 10 * 8 * 100 = 8 t / m 2. The payload of each of the floors is 10 * 8 * 150 = 12 t / m 2 , i.е. for the whole house 24 t / m 2. The weight of the house itself is approximately 44 tons. The aggregate load (44 + 24 + 8) * 1,2 = 91,2 tons. Assume that the soil is soft-clay clay, piles will be immersed for 2.5 m (their bearing capacity is 5 tons ), then we need 91.2 / 5 = 18.24, i.e. 19 piles. The depth of the piling is chosen based on the type of soil. For stable dense soil, piles with a length of 2.5 m are usually sufficient. If the soil is unstable in the area, the length of the pile must be such that it reaches a denser soil layer. 108 mm – an excellent option for the construction of private houses of any type, withstand from 5 to 7 tons. The distance between piles is calculated for each individual project. 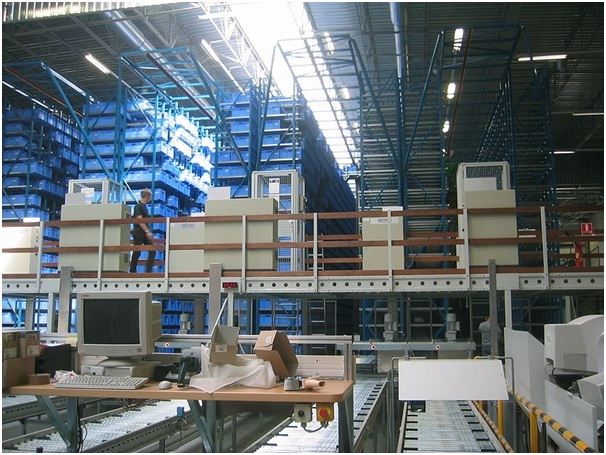 It is not recommended to make a distance between supports of more than 3 m for frame houses, and more than 2 m – for buildings from a foam block and gas block. If there are strong winds in the region, the distance between the supports should not be more than 2.5 m.
Once again, we emphasize that when it comes to such a serious matter as a foundation, it is better to make the most accurate calculations, and not to save on building materials and equipment.